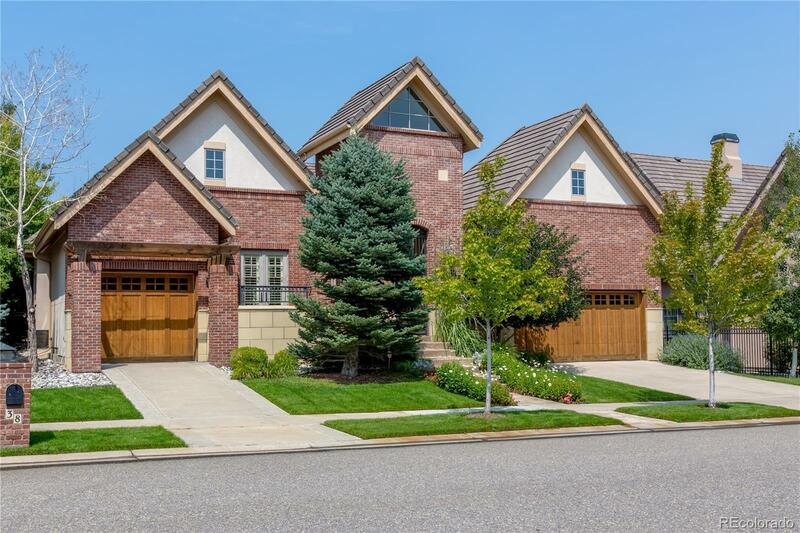 Welcome to 38 Royal Ann Drive at One Cherry Lane, a luxurious gated community located conveniently in the Denver Tech Center. This Ranch style home offers seamless indoor to outdoor living with natural light beaming through expansive windows throughout the main level, and outdoor patio seating situated adjacent to the main living room and kitchen. This lock and leave oasis features a state of the art kitchen with Sub Zero Refrigerator and Freezer drawer, Viking oven and cooktop, and one of three custom stone fireplaces providing the perfect serene setting. The Master Bedroom suite offers a 5 piece master bath with his and her closets. An additional guest bedroom and main floor office with french doors leading to a front courtyard, round out this beautiful first floor living space. Located in the lower level is a full bar, Spectacular Wine Cellar, 2 additional ensuite bedrooms with an oversized Rec space for family entertaining. The best designer, turn-key home in the Villages.